Overview/Osradharc. Ancient pilgrim route with a strong penitential tradition that finishes beneath one of Ireland’s highest and most revered mountains, Mt. Brandon in the West Kerry Gaeltacht. The attractions here are rooted within people and place and completing this path is one of the best ways to experience the elemental, skeletal topography of the west Kerry landscape. Route is well way marked with information panels outlining stories from the surrounding landscape with many antiquities, historic buildings and religious sites along the route. Lean lorg na Naomh- tar ag siúl inár measc in Gaeltacht Chorca Dhuibhne – beidh fáilte romhat. Grade/Grád: Moderate grade, linear walk requiring transport at both ends. Care required on the relatively steep terrain that leads from the summit of Reenconnell Hill. Highest Altitude/Pointe is airde. Reenconnell Hill 274m. Time/Am. 4 to 5 hours. Start/Tús. Follow the R559 west from Dingle. At Ceann Trá (Ventry), swing left for Ventry Beach. Cosán na Naomh is signposted from here. Cosán na Naomh is a linear walk and therefore return transport, if required, should be pre-arranged. Be prepared: Good walking boots and suitable outdoor wear as well as food and drink are required as you will not pass a shop en route. You may wish to purchase refreshments at the Post Office at Ceann Trá (Ventry) nearby to the Trail Head. The walk is way-marked using the symbol of a yellow monk. A map with numbered locations and background information of the main sites is included in the pack. Take three photos along the route as evidence that you have completed the walk. This may be done in one day or over a number of days. These locations are at the Trail Head mapboard at Ventry Beach (marked 1 on the map), at the mapboard at Kilmalkedar (marked 9 on the map), and finally at the mapboard at An Baile Breac at the foot of Mount Brandon (marked 12 on the map). 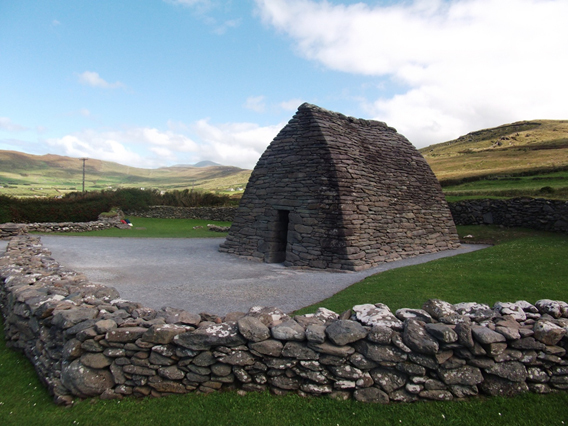 On completion, present your Medieval Pilgrim Paths passport and photographic evidence on camera phone or camera to the Tourist Office in Dingle (Opening hours: Mon-Sat 9am-5pm and 9am-5pm Sunday during the summer season). Your name will be recorded in the Cosán na Naomh Pilgrims’ Book. You will be presented with your Cosán na Naomh Certificate of Completion. Each month the names of those completing the Walk will be added to the Cosán na Naomh/The Saints’ Path Facebook page. If you enjoyed Cosán na Naomh, you may wish to complete the other 4 medieval pilgrim paths and receive a Teastas Oilithreachta (The Irish Pilgrim Walk Certificate). Passport Stamping Point: Dingle Tourist Information Office. Is siúlóid líneach é Cosán na Naomh agus dá bhrí sin ní mór duit socraithe taistil a réiteach duit féin, más gá, sara dtosnóidh tú amach. Bí réitithe: Tá buataisí maith siúil agus éadaí oiriúnacha riachtanach chomh maith le bia agus deoch toisc nach bhfuil aon siopa ar an gCosán. Is féidir bia agus deoch a fháil in Oifig an Phoist Cheann Trá atá cóngarach do thús an Chosáin. Tá an cosán marcáilte feadh na slí le comhartha manaigh buí. Tá mapa le hionaid marcáilte le huimhreacha sa phacáiste seo agus tugtar buneolas ar na príomhláithreacha duit. Ní mór duit trí ghrianghraf a thógaint mar fhianaise gur shiúl tú An Cosán. Is féidir An Cosán a shiúl in aon lá amháin nó thar roinnt laethanta. Tóg grianghraf ag an gclármhapa ag tús na siúlóide ag Tráigh Fhionntrá (uimhir a 1 ar an mapa), ag an gclármhapa ag Cill Mhaoilchéadair (uimhir a 9 ar an mapa); agus ar deireadh ag an gclármhapa ag an mBaile Breac (uimhir a 12 ar an mapa) ag bun shleasa Chnoc Bréanainn. Ar chríochnú duit, tabhair do Phas Oilithreachta agus d’fhianaise grianghrafadóireachta leat go hOifig Turasóireachta an Daingin (Amanta Oscailte: Luan-Satharn 9-5pm agus Domhnach 9-5pm i rith an tSamhraidh). Déanfar do phas a stampáil ansin. Déanfar d’ainm a thaifead i Leabhar Oilithreach Chosán na Naomh. Bronnfar Teastas Chosán na Naomh ort. Cuirfear ainm na ndaoine a shiúl an Cosán ar leathanach Facebook Cosán na Naomh/The Saints’ Path uair sa mhí. Má bhain tú sásamh agus tairbhe as Cosán na Naomh, b’fhéidir go mbeadh fonn ort na 4 chosán Oilithreachta Meánaoiseacha eile a shiúl agus Teastas Oilithreachta (The Irish Pilgrim Walk Certificate) a fháil. Tuilleadh eolais – Cosán na Naomh.